Clarborough Village Ventures were formed in 2010, after two residents decided that there should be more social events within the villages of Clarborough, Hayton and Welham to bring the community together and have fun! If, in the process, funds are raised then these are given to local causes. See foot of this page for contact details. This was an open meeting. 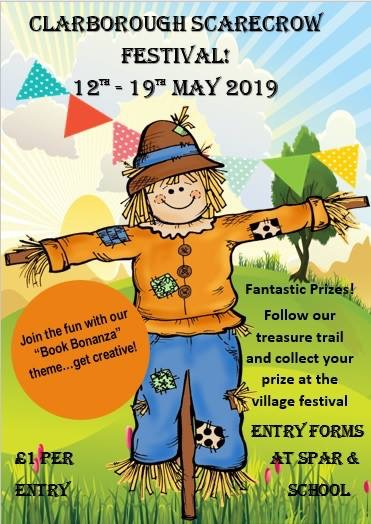 The date for The 2020 AGM has also been set for Wednesday 29th January, 2020..
Clarborough Village Ventures’s biggest event is Clarborough Festival, one of the biggest thing in Clarborough’s year. 2019 date just announced: Sunday 19th May. Why not get into our Scarecrow Competition too - choose a favourite character from your chosen book? Click here for entry form. Closing date is near - 28th April. For our galleries of photos of past Festivals, go to our Festival page. In the autumn 2011, in conjunction with Retford Lions, Clarborough Village Ventures planted sacks of spring bulbs which brought colour to kerbsides in Welham and Clarborough through springtime. Further plantings took place in winter 2012/13. Clarborough Village Ventures also played a lead in re-launching the traditional Lammas Festival in conjunction with St.John the Baptist Church in 2011. Some photos from the 2012 event are available here. This was repeated with some interesting twists over the weekend of 3-4 August, 2013. Our hugely successful Victorian Christmas Market was held Sunday 1st December, 2013 at St. John the Baptist Church, Clarborough. For a few images of previous events, click here. Our Victorian Christmas Market is now an annual part of our local scene.